A few weeks ago, I had back to back work trips to Denver. I decided to extend the 2nd trip over the weekend and Bobby came along for a fun weekend getaway in the Mile High City. A couple of beers and we were off! I had to do a presentation Friday morning, but the afternoon was free! We headed downtown to a place called Recess for a late lunch. It is in the Highlands District and a very cool spot. It would be a great place to visit in the summer…the patio is great! We grabbed a bite and stayed for a few more beers and some games…did anyone know this game existed? 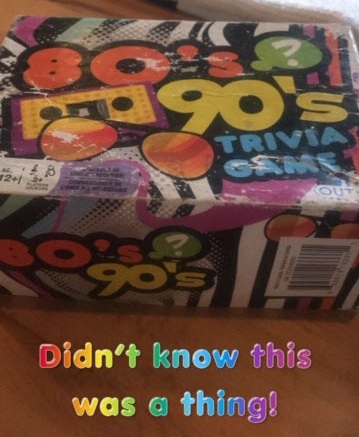 Turns out, I’m still not good at trivia, but I have fun playing. Especially when it is 80’s and 90’s! After Bobby successfully defeated me at trivia…probably because he’s older and wiser, we headed to another brewery called Prost. When the name means “Cheers!”, you have to check it out! By this time, the weather had started to get really cold and the news predicted 3” of snow. We had a quick beer at Prost before heading to our next stop on our Highlands adventure. Our next spot is somewhere that I have been before on a work trip, but knew Bobby would enjoy. It’s a speak easy that you enter through a book case. The cocktails are great and the atmosphere is really fun. I had 2 drinks-1 off the menu and another that was a surprise. Bobby had more boozy drinks and enjoyed his too! Can you guess which one is mine? By this time, that 3” of snow had started to come down hard. We moved up our dinner reservations at LoHi Steak Bar-which was really good! We were trying to hurry a bit because we knew we needed to grab an uber back to our hotel. So no pics of the delicious dinner or the super modern and fun restaurant. Trust me, it was great though! That 3” of snow ended up being more like 8”, so we got a later start than planned on Saturday morning. We headed down to Union Station to people watch and grab some coffee. Pigtrain Coffee is the perfect option. It is located inside Union Station and they brew local coffee. I always try to support local when I can! Armed with coffee, we set out to explore downtown. We hit up the Denver Museum of Contemporary Art. It is pretty small, but they had a good Georgia O’Keefe exhibit. There was also a tattooed lemon exhibit, which was odd and interesting, but made me question my understanding of art. We walked around downtown Denver and found a nice park with lots of pups. Then we ended up at Denver Beer Co. The vibe, music, and beers made this one of my favorite stops of the trip! I would go back here over and over. There was a food truck outside, but we decided to go around the corner to this little poke place for some lighter food. 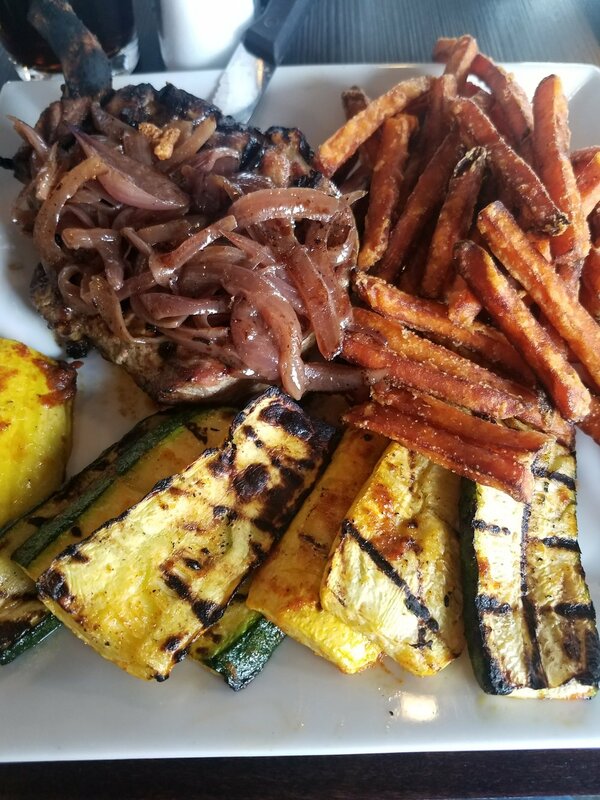 Fresh, delicious, fast….perfect pit stop before we headed to our next neighborhood in downtown Denver to explore! The River North Arts District…aka RiNo District is known for street art and Great Divide Brewing Company. I particularly love Great Divide since their mascot is a Yeti. We grabbed a beer and then headed out to explore the city and see the street art. It was a short trip, but we had a great time exploring Downtown Denver neighborhoods….we can’t wait to go back when the weather is a little nicer…and we will probably bring our friends! No we didn’t go to Manhattan for this time honored tradition....but we did go to the city we’re going to end up moving to and taking over (ahem Mayor): Martin City! We had never been before and have no idea why they celebrate it so damn early but we’ll be back! 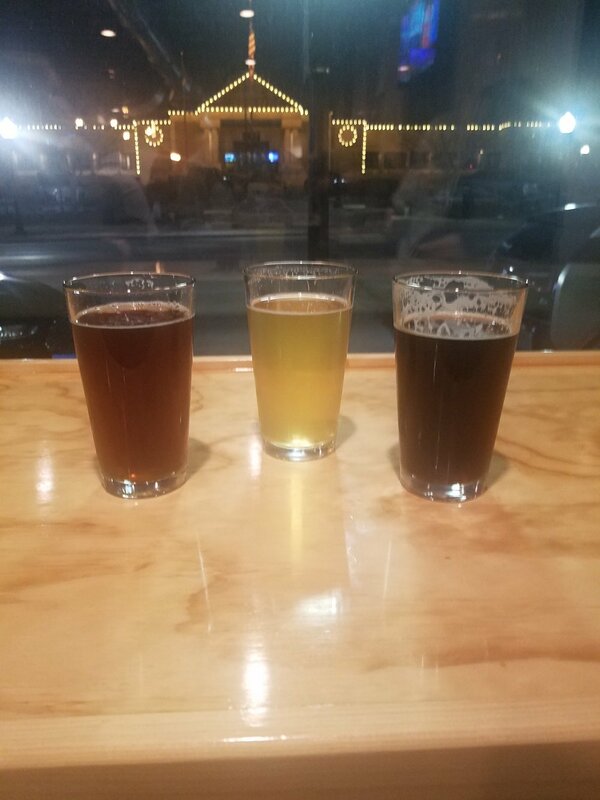 We started off with some breakfast beers (obviously) at Martin City Brewery and ease into some tacos, wings, Mac and cheese and Irish fries (fries smothered in corned beef, 1000 island dressing, queso and sauerkraut). Some of us ordered better than others, clearly! Check out some action shots and do yourself a favor and go there next year! This bear was Mr Grumpy Pants! What does Unfiltered Adventure do when there are no plans for the weekend? We make plans happen! This Friday we started at the newly opened Transport Brewery in Shawnee, KS. They were having a Food Truck Friday event and we thought there is no better reason to check out a new brewery - beer AND food! Leslie, Stephanie, and I arrived around 6:30pm and the place was already packed! We managed to snag some chairs at the front windows and had a good time people watching and critiquing parallel parking skills. At this point, you might be thinking “Where is Andrea?”. Answer is, her work company is pretty awesome and they were out celebrating some recent awards they had won. For some reason, Building 4 did not get the invite. The brewery offered several in-house brews along with guest taps from other local breweries. We started the night trying the Sister Cities Red Ale, the Can’t Pay My Pils Pilsner, and the Broken Rail Brown Ale. The names are so clever! All were good, but I finished my night with a few more Brown Ales. After our first round, Leslie tried and really took to the Squire’s Coffee Stout. It’s served in an adorable coffee mug! 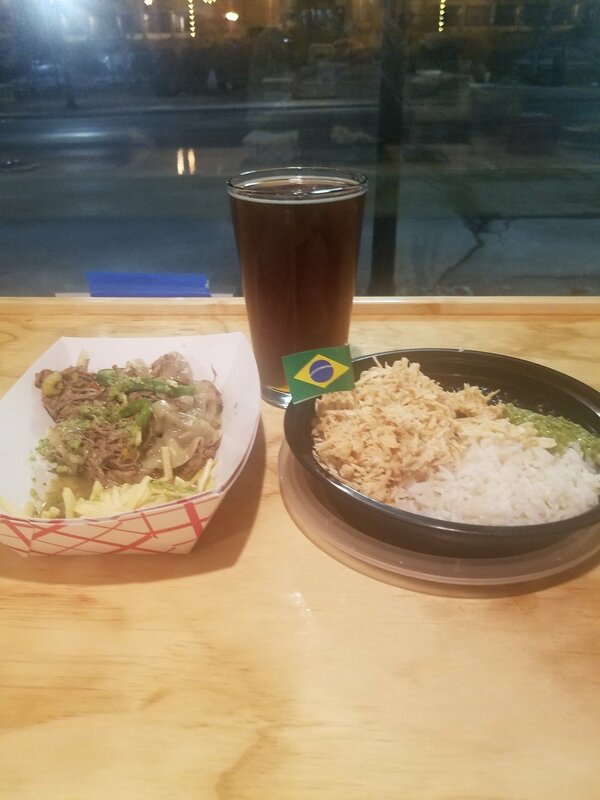 As I mentioned, there was a food truck at Transport Brewery on Friday night and it was Taste of Brazil. The menu looked delicious and items 1, 7 and 9 came highly recommended. Leslie and I opted for Number 1 with Shredded Chicken while Steph went with the Number 3 that included Shredded Beef Pot Roast. We highly recommend the Rice and Beans with your choice of Meat and strongly suggest topping it with their from scratch chimichurri sauce! The service was impeccable and they were super friendly! All in all, we would definitely go back to Transport Brewery. The space is super welcoming and both kid and dog friendly. The addition of food trucks and other local beer offerings make this a place that everyone can enjoy. We even managed to get our friend Shauna to meet us since she lives close by! Hi Shauna! While finishing up beers at Transport Brewery on Friday, we had to come up with a plan for Saturday Funday. While some suggestions (ahem…Stephanie’s) would have likely landed us in jail, we lucked out and found a new restaurant to try. We headed to Tabard’s Ale House for lunch. This place has a huge bar, a good TV set up (they even turned on the Texas game for Leslie) and an even cuter patio we want to try when warmer weather decides to show up. Tabard’s offers soup and salads, flatbreads, burgers, sandwiches, pastas and entrees - all from scratch. I tried the Mustard Grilled Pork Chop and was in heaven! This 12oz BONE IN chop was seasoned with dijon and thyme and topped with caramelized red onions. It was the best pork chop I have ever had! Leslie tried a veggie sandwich that included their grilled Moroccan Vegetables and was also very happy with her food. Stephanie had the wings, which were good, but we all know she secretly wanted either of our meals! Oh, and Andrea ditched us again to hang out with an out of town friend for her bachelorette party. Good excuse I suppose!! We rounded out Saturday Funday with a nice bar crawl down 119th Street. We checked out Johnny’s Tavern and ended up at the Ainsworth. Both provided excellent cocktails to conclude our Saturday Day of Fun!